Certain to take her breath away, this stunning diamond swirl ring is made using glistening ten karats white gold. The ring is finely polished and adorned with shimmering round-cut diamonds. Each of the diamond is arranged in a beautiful prong setting, making the ring twinkle like a night skyline. 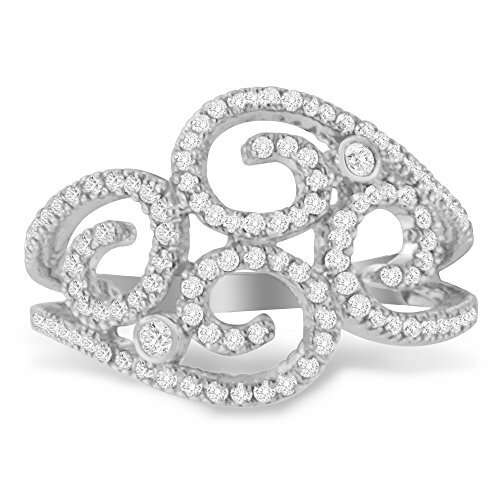 Original Classics Swirl Shape Diamond Ring in 10k White Gold. Comes in Sizes 6, 6.5, 7, 7.5, 8. SUITABLE GIFTING CHOICE for any Occasion: Wedding, Engagement, Christmas, Valentine's Day, Mother's Day, Birthdays, Parties and Gifts. If you have any questions about this product by Original Classics, contact us by completing and submitting the form below. If you are looking for a specif part number, please include it with your message.